Samsung has unveiled a new mobile processor that offers more performance and less power consumption than previous iterations. 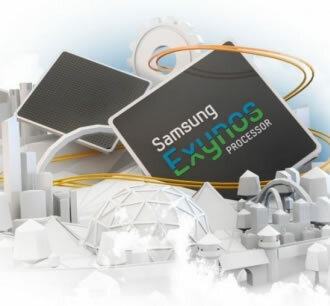 The Exynos 4212 has two ARM Cortex-A9 processing cores clocked at 1.5GHz, which is up from the Exynos 4120's 1.2GHz configuration (the 4120 was used in Galaxy S II models). Along with the frequency bump, the latest iteration has received a die shrink, as Samsung reduced the fabrication process from 45nm to its 32nm HKMG technology. The new SoC supposedly offers 25% more CPU power (no word on how much the frequency increase offers) and a 50% boost in 3D graphics performance, all while consuming 30% less power. On the graphics front, Samsung notes that the chip has codec accelerators that support digital still images, the ability to record and playback 1080p videos, as well as an image signal processor and HDMI 1.4 support. Unfortunately, more details haven't been provided about the GPU hardware. The Exynos 4212 should find its way into smartphones near you sometime next year as Samsung plans to ship samples by the end of 2011. There's no word on precisely what devices will use the SoC, but for whatever it's worth, the Galaxy S II LTE and Galaxy S II HD LTE were announced last week and supposedly have a 1.5GHz dual-core processor. As a side note, we imagine the Exynos 4120 will be paired with Samsung's new 1/2.3-inch 16MP CMOS S5K2P1 sensor, which is capable of capturing 16:9 video at up to 8.3MP@60fps as well as 16MP for point-and-shoot images at 30fps. Samsung also launched a 64GB flash storage module for smartphones (most existing handsets max at 32GB).